4-Week New Swimmer Course | Mediterra - Swim & Run Better Than Ever! Learn to swim smoothly and enjoy it more than ever. Enjoy patient, gentle, skilled guidance into pleasant, smooth swimming. Two 45-minute lessons per week, for four weeks. Small, encouraging practice group, with up to 4 people like you. If these dates and times are not suitable for you, you may consider our monthly Freestyle Technique 4-Week 4-Lesson Series, or arrange for Private Lessons with one of our instructors. 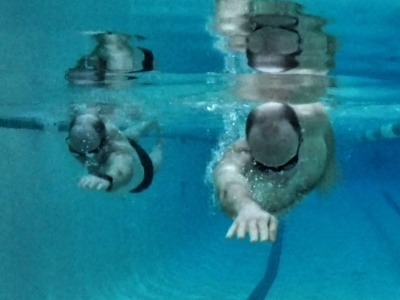 Enjoy our step-by-step, systematic approach to learning a smooth, pleasant freestyle stroke. Learn to position your body and move in a way which allows water to support you, removing struggle, increasing control. Discover how to balance and streamline your body, then use rotation to more easily empower your stroke. I highly recommend for everyone to take this class. I was a way better swimmer after just two classes, but more important I now have the base and ability to continue to improve everyday. My coach is an excellent teacher with great communication skills. He helped me to visualize a more efficient way to swim and gave chronological steps to get there, all while making swimming more fun. $129 per person, up to 4 people. Bring a friend or two to fill your training group! Your lesson will be lead by Coach Jamee. Lessons will be on Monday and Wednesdays, 2:00 pm to 2:45 pm, 45 minutes long. The April series is starting on Monday, April 1, at Courthouse Fitness Battle Creek. The May series is starting on Monday, May 6, at Courthouse Fitness West Salem. You are encouraged to arrive to the pool 15 minutes early so you can get in the water and warm up with gentle, pleasant movements before the start of each lesson. It will be helpful to your learning process if you will be able to schedule your own practice time outside these lesson times. It is important to your progress that you practice on your own between lessons, at least once, if not more times. Please hold off on scheduling lessons until you have room in your schedule to include those personal practice times between. They don’t need to be long practice sessions, but frequent practice will be very good for you. This course is intended for those who DO NOT experience strong fear or anxiety in water. For that we would encourage you to attend our 4-Week Pool Comfort course. 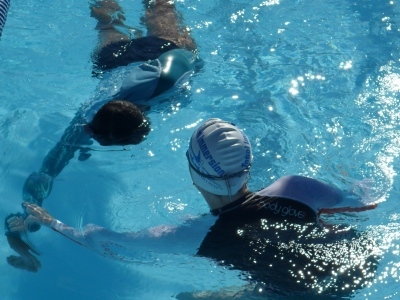 This course is suitable for those who cannot swim yet, or for those who can swim in some fashion, but would like to make their stroke feel and work a lot better. You should be able to submerge your face underwater, take your hands and feet away from the edges and bottom, and hold your breath comfortably for 15 seconds. 4 weeks, with two lessons available to you per week. Lessons are 45 minutes in pool, starting promptly. The instructor is in the water with you, ready to guide with words, hands, demonstrations, and personal feedback. Access to club changing room and pool (for guests at Courthouse Club Fitness).